This unique property combines pristine Caribbean waters, natural beauty and exceptional personal service to create an idyllic tropical island retreat. Guest rooms at this lovely resort include furnishings inspired by the colors and textures of the surroundings, along with Caribbean themed artwork and modern amenities. Many rooms offer large private balconies or patios overlooking the Caribbean Sea. Whether guests come for the exceptional diving opportunities, water sports, romantic dining or mainland tours, there is something for everyone at this intimate resort. 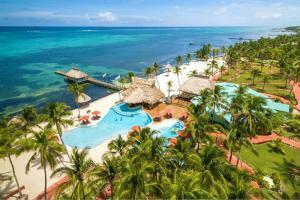 Located 6.5 miles north of San Pedro Town on the island of Ambergris Caye, Belize.